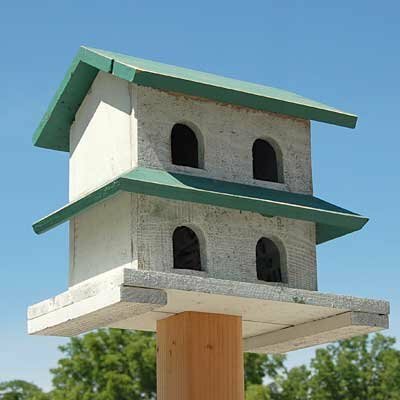 House a few purple martin families in rustic style by placing this Bird In Hand Hanover Purple Martin House in your yard. This lasting, wooden shelter provides four separate apartments, helping a martin colony establish itself in your area. The green and white color scheme throughout the item adds a classic and familiar look to it, while its distressed finish lends character. This home is crafted from repurposed and reclaimed wood, diminishing landfill waste and bringing handcrafted art to your yard. The four arched entries mimic windows, and their 2" width and 2.5" height allows birds to reach the interior easily. A pitched green roof covers the shelter, with a matching awning visually dividing the two levels. Lift this roof and the interior, wooden divider for nest checks and seasonal maintenance. Two slats on the generous base of the unit act as feet, for resting it on a level surface, or the home may be placed on a post or pole for versatility. The distressed elements on the reclaimed wood body lend antique charm to this abode, while ensuring durability for your feathered friends. Bring timeless style to your martin sanctuary with this Hanover Purple Martin House. Made in the USA. This product is handcrafted by the Amish using reclaimed and recycled wood. As such, each individual item may vary slightly.